While there are plenty of PDF writing software and online conversion services around that can help you save web pages as PDF files, the fact is that you don't need any of them as long as you have Google Chrome on your computer. Open any web page inside Google Chrome, press Ctrl+P (or Cmd+P if you are on a Mac) to open the Print dialog and change the destination printer to "Save as PDF." 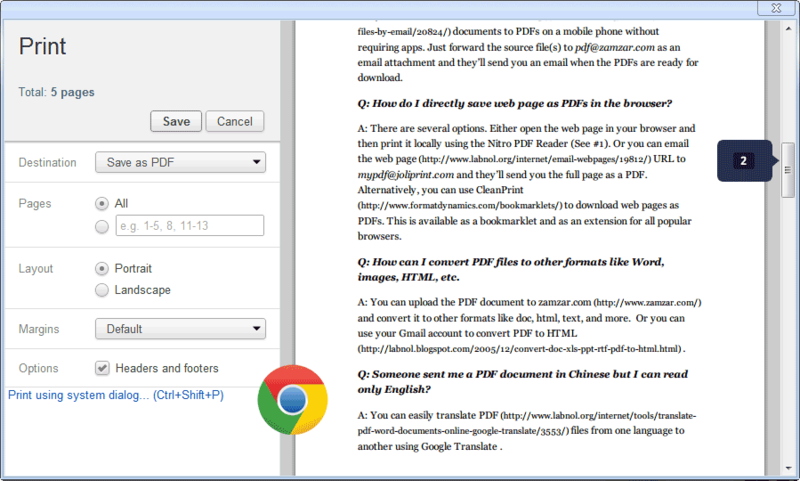 Hit the Print button and the current web page will instantly download as a PDF document. Simple! This is especially useful for downloading PDF copies of web pages that involve transactions or session data – like the checkout page on a shopping website – because you often cannot pass such pages to any online PDF conversion service. One more thing. You can also use Chrome's PDF engine to convert your local image files, text files and any local HTML web pages to PDFs – if you an open a file in Chrome, it can convert the file to PDF.